What's Up New Haven: Mini Flash Mob Opportunity in New Haven! Mini Flash Mob Opportunity in New Haven! Listen up, New Haven: A mini flash mob is coming to your neighborhood. Cool? Absolutely! But the reasoning behind it is equally as important. World AIDS Day 2013 is upon us, and the theme this year is "Getting to Zero". Until AIDS is no longer a threat, we as a community must raise awareness so that we prevent rather than treat the virus. 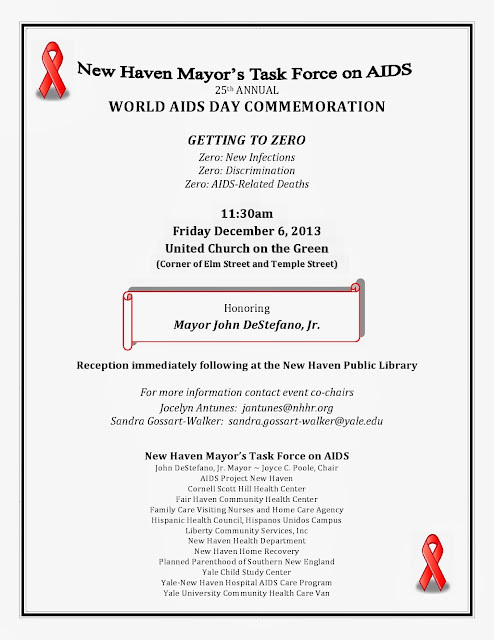 The New Haven Mayor's Task Force will host an event in honor of World AIDS Day on December 6th, 2013. There will be a traditional reception on the New Haven Green honoring Mayor John DeStefano (please see flyer below), and a not-so-traditional way to promote awareness: a mini flash mob! Have you ever seen such positive energy radiating from that train station before? Wouldn't it have been fun to be a part of that excitement? Now it's YOUR turn to Flash Mob for a great cause! There will be a gathering with the Mayor's Task Force on the Green before the ceremony. Details are being finalized, and this post will be updated as we more information is provided. For any additional questions regarding the World AIDS Day mini Flash Mob, please contact Sandra Gossart-Walker or Jocelyn Antunes.